Savory Hamburger Steak, perfect for any day of the week. Before I get into the recipe today, I just had to mention that it is Mike’s and my wedding anniversary today. Yep, 35 years ago today we said our I do’s. Not sure how it has been that long, wow! But then when I look at our four kids and see our two grandchildren, I realize it has been a few years. It has been a great ride throughout the years and I hope that there are more to come. Now on to the recipe… When I was a kid I was never too thrilled to see my mom making hamburgers for a meal. I was not a big fan back in the day. Fast forward to the present and I have to say that I enjoy a great burger. And yes, I really enjoyed this savory hamburger steak. This time around I decided to change things up a bit. I decided to forget about the bun and I replaced it with a savory gravy. I am not saying the this is a classy way to serve a hamburger, oh well maybe it is a bit classier than your everyday burger. When serving a savory hamburger steak, mushrooms are definitely a must, well at least in my book. 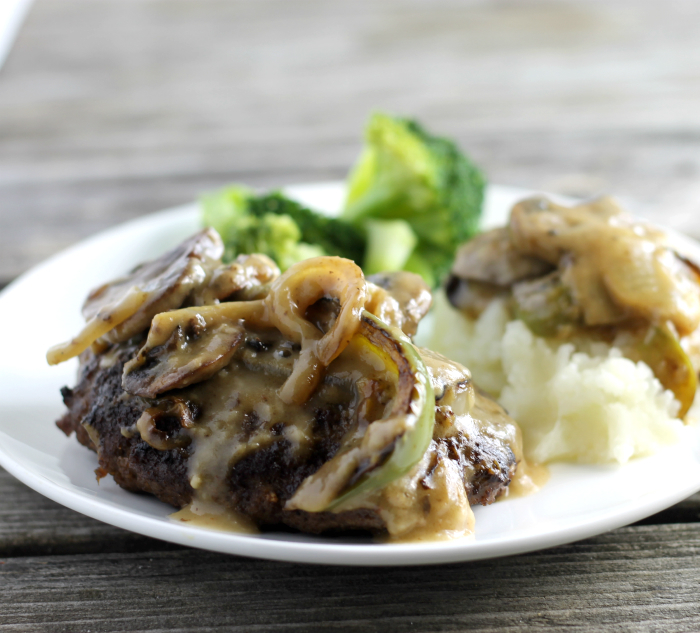 Add some onion, green peppers, and gravy you have the perfect savory hamburger steak. 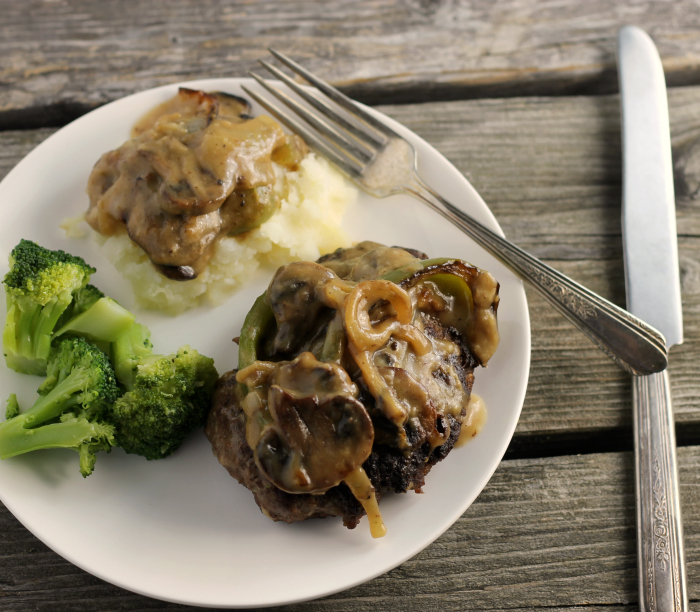 I served the savory hamburger steak with mashed potatoes and broccoli for an easy but delicious meal. 3 tablespoons flour and 3 tablespoons of water to thicken the gravy. While vegetables are cooking add the breadcrumbs, egg, Worcestershire sauce, and salt and pepper to taste. Mix until well combined. Form into hamburger steaks. Once the vegetables are cooked and removed from the skillet add the hamburger steaks. Cook until the steaks are done to your liking. Remove from skillet. Remove all but 3 tablespoons of drippings from the skillet. Stir in 3 tablespoons of flour. Slowly add the beef broth, whisking as you pour. Add back the vegetables and hamburger steak. Heat until vegetables and steaks are heated up. Serve with mashed potatoes and your favorite vegetables. Happy Anniversary to you and Mike, Dawn! My husband will surely love this since he eats all sorts of meat patties. Happy Wedding Anniversary to you and Mike 🙂 Love the recipe. Looks so good! Happy Anniversary! This looks like a delicious, hearty meal! I agree with you on the mushrooms – LOVE mushrooms! Great recipe! First off, happy anniversary! That definitely deserves a virtual *high-five*! Second, I’m right there with ya on a good burger. I seriously think my favorite meal is a classic hamburger! I could definitely get behind this hamburger steak, though…it looks delicious!! Dawn…so good to see you back! Happy Anniversary! I love a good hamburger too and most of the time I do not care for the bun…I like how you dressed this hamburger…great meal! Happy Anniversary! And who doesn’t love a good burger? I don’t have the same appetite I used to (a good thing!) so I often toss the but when I get a burger these days. This is the perfect solution — such a nice looking meal. Thanks! I haven’t had hamburger steak in years and it has been too long! Thanks for the inspiration! Happy Anniversary! 35 years – that’s a beautiful thing! Happy Anniversary! You certainly don’t look old enough to be married that long! 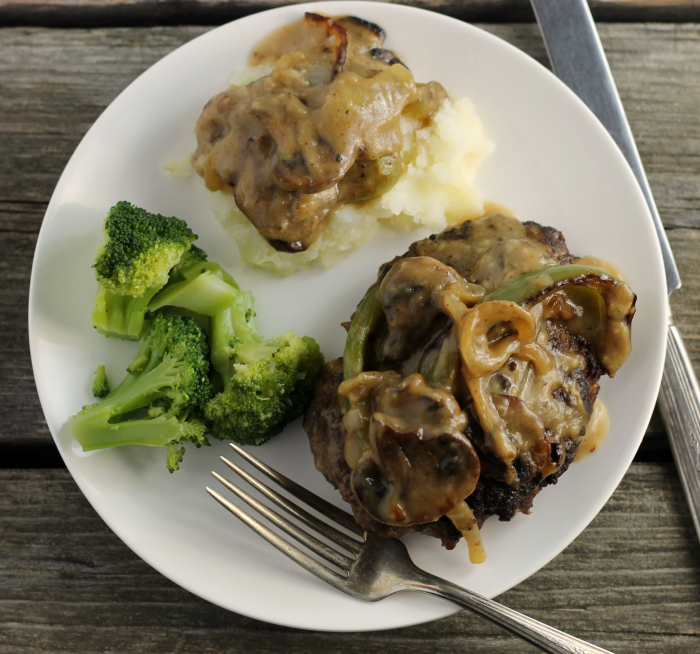 I love a good hamburger steak – the gravy definitely makes it classy! And delicious too.